Had a great ride today (http://connect.garmin.com/activity/269365392) around the local area on some unknown trails for me. It was only about 14 miles but my legs feel like it was an epic. Two big climbs helped it feel like that. As the picture above shows some of it was pretty wet. Buy the one part I wasn’t looking forward to on my hard tail turned out drier than expected. Yes there was a little down hill section that the other guys said was a bit steep and rooty. Having not done anything ‘technical’ on my 29er and certainly not with the SPDs on I was a little apprehensive. It turned out to be more fun than I expected and the steep track had drained enough to prevent it being too slippy. It was the first time I had dropped the seat post and got into a proper negative riding position. The route took us along the hillside with great views (better on a nice day) to our right. The trail through the trees was good fun with some off camber roots and narrow tree gaps. Then there was a decent bit of down fun to be had, nice and flowing with some twists and turns on the steep hill side. After this and a pedal back up we looped into another wood for a short section where we also came across some jumps. Not for me today, but a good spot to come and session in the dry.. I downloaded the route which shows one down near Roundway. Somewhere else in your blog you commented on downhills in the Roundway Heddington area. 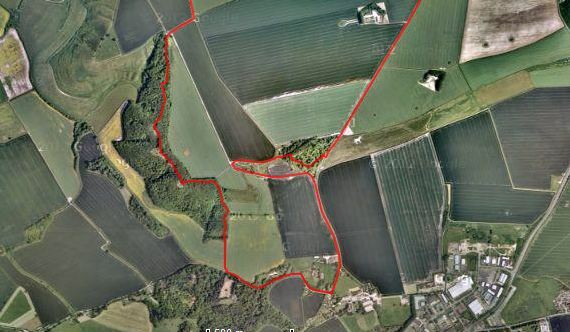 I’ve been thinking of exploring this area (not having been further west than Morgans Hill til now) and wonder if you could suggest which trails are worth a go and which not. Thanks. Best bit of that ride is the part I highlighted on the picture of the map. You can do the “down” twice as you can loop back at the top.